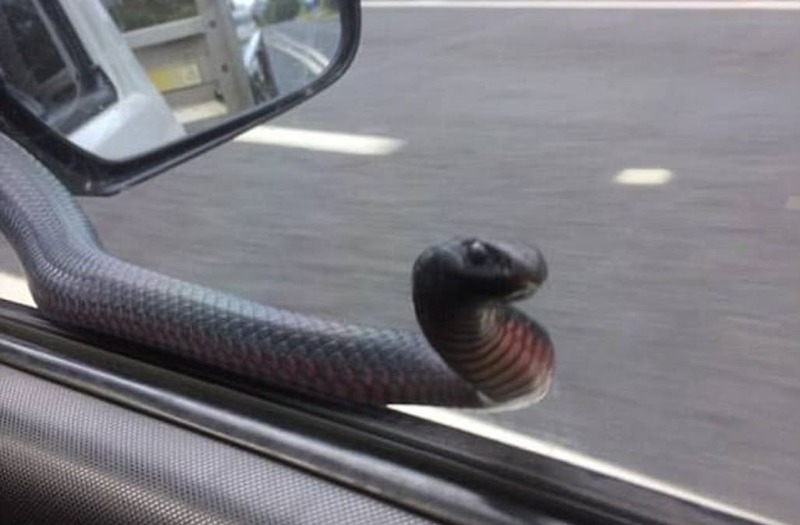 Ted Ogier was traveling on the New South Wales south coast Wednesday when he spotted a black, red-bellied snake slithering alongside his car. Ogier said the reptile had slithered from the hood of his car and wrapped itself around his side mirror, looking and apparently hissing at him. "It'd come out from under the engine bay under the bonnet, it was probably a bit warm there," Ogier told the ABC, adding that the snake was also "tapping on the window a couple of times because it obviously wanted to get in." Olgier said he eventually pulled over and called his coworker, Kai Pearse, who later arrived and removed the snake with a broom. His employer uploaded photos of the incident on Facebook. "I just had a broom in the back of the ute and basically just got him off the car nice and safely, and just ushered him into the bushland off on the side of the road," Pearse told the outlet. The two believe the reptile was measured at about eight feet long and that it probably was just looking for a warm place to set up camp. "Last night it got a bit cold down here on the South Coast, so I think he's got up into the engine bay of the vehicle, and he sat up on the engine to keep himself warm," Olgier said. "Then this morning Ted's taken that vehicle down to Eden and it might've got a bit too hot in there, so he wanted out." And despite the frightening experience, Olgier contended that there were still worse critters to encounter on the road. "Not as frightening as getting a spider on the inside — spiders are one thing I don't like, but I don't like snakes either," he said.